Modern design and luxury material will make you charming, elegant and chic! 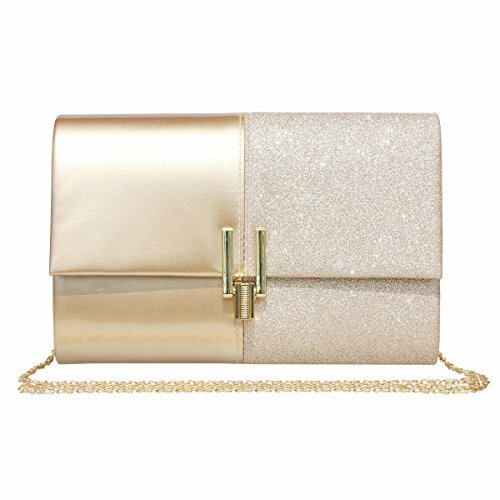 FEATURES - glitter and patent leather detail；Front flap with metallic closure,classy and elegant,easy to match your shoes, Princess style dress,or nail polish as well for wedding or prom. CAPACITY - Not too small or too big, Pretty cute but spacious inside, Enough space for your essentials,such as smartphone iphone 9 Plus,lipstick, tissues,keys,small mirror makeup and credit card. Carry option- 3-in-2 STYLE - Evening bag/Handbag/Shoulder chain bag,can be clutched by hands or hung on shoulders with the detachable chain. OCCASION - As evevning bag is perfect for parties, weddings, date nights, or family reunion, prom, banquet and cocktail party when you take part in special occasion. as a daily clutch,Stylish, leisurely when you're out of the street and have a vocation. SERVICE - We love our customer, please do not hesitate to contact us if you have any questions,we will try our best to address all the issue they may meet in time.